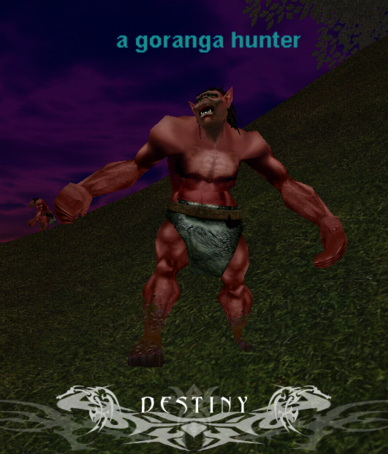 This mob's name should be: "a goranga hunter". This guy conned yellow to my level 53 bard. I had virtue and sat at about 3450 hit points. He could not be feared or mezzed by me so I went to chant kiting. I used my disease/poison/cold chants until he managed to root me once and beat the crap outta me. Luckily his root never lasted long. I wound up chanting disease and poison and then throwing in my magic resist song. He still managed to root me a time or two and beat me down and he hit me with Stinging Swarm several times. To make a long story short, he didn't run until he was under 10% and between his rooting me and getting to beat on me and DOTing me, I was at 21% of 3450 hps by the end. All that and he only dropped 3pp. Killed one today,definitely fear resistant,at least 13k hp's.Tried to root me, but never stuck. Also dropped a Hoop of Magi'Kot. Overall, not a very mana efficient target. I wonder if they are going to nerf ME zone or they have done that already. As a 56 necro using both Invoke Fear and Trepidation with multiple castings these guys simply would not fear. They are either immune to it or so resistant as to be virtually so. I know from duoing against the hunters that they are very resistant to spells period. The only reason I didn't die solo was my decent necro skills and a little bit of luck. They root, nuke, and hit hard enough and fast enough to be very dangerous to casters... a necro pet certainly cannot solo him no matter what buffs he has -- he just doesn't have the hit points. The best method I found for dealing with him and all the gorangas (albeit quite risky) was to charm a coterie (vampire-type mob) over the hill, buff him, and then mow through every goranga in sight 1-3 at a time depending on type. For doing this you'd best get a partner with at least root, regrowth, and sow -- Malosi or Tash are also a great plus here. Some classes may be able to solo these, but the necro is not one of them. Root-dotting may work, sometimes, but it's just not worth it IMHO. Oh well, I'll get em solo some day. These can be level 57, I have killed 2 that were yellow to my 56 shaman. These cast roots and nukes up to 220ish, and hit for about 170 max, and fairly fast even slowed. These are cake for the level tho, I could probably solo one as bout as easy as a 52 elder wyvern in Skyfire. Me and a 53+ tank class rock, we get way up on the cliff and avoid most aggro, I always pull so I know the mob is slowed. A 56 player cannot single pull these so wait for them to wander away from each other a fair distance or you will get an add, that goes for all gorangas. I am here for XP which is pretty good ( loot is average, couple pp per drop and words usually, maybe a goranga idol or spiked club ) as there is steady pulls and with a melee with decent AC or damage output all gorangas are cake for the level the are. Thing in ME is to avoid the trains, and if you set up camp in the right spot you will never see the trains. Other mobs here are considerable higher level and harder, like bats and mind burrowers. The 4 arms guys are for a full group but this zone is more like 52-60, anything above or below is kinda wasting time here. It has been my experience that 55 is the cut off to fearable mobs. At 56, mobs that are of any type can summon no matter the class. In UP, the warrior type mobs summon when they are lvl 56, level 55s didnt. Takes some time to bring em down and dont get to close ! I was soloing in ME yesterday and pulled one of these. I then conned it and discovered that it was yellow to a 56 shm. Had to slow and malosini it, but after that with KEI, was only a matter of time. This sucker has at least 10k hp. 50 necro....Ones ive been pulling are near zone....very resistant to Fear and When it did hit the overcame it pretty fast. Dark blue to me. I've had the same experience, however, it's only been about 1 mob in 10 or 20 that's had this extra special "no Fear" attitude. The rest, I've been able to fear kite with no problem at all. After a nice slow, these guys take centuries to take a swing at me. thats because mobs level 55+ are immune to fear. I am a lvl 56 Druid With epic, and i soloed one of these today, it conned even to me and resisted like **** so i had to use root and epic to kill him, think i got in 2 Winged deaths before i was too low on mana to cast anything but root. When he was at about 20% a 55 war came and helped me out some, but given nother 5 mins or so i could have taken it down, with c2 i would have owned his *** ;), sure was fun, and i got nice xp too, never thought i could ever solo a even con mob after 50. He nuked me some, max 301 dmg and kept casting greater healing on himself when he got below 50% hps, his root spell is a joke, 10dmg max 5 sec duration on anyone post lvl 50, kinda like those spiders in dreads. I was under the impression that mobs above lvl 51 all summon. If this is true, there is no way you could root/dot this mob. Are there 51+ mobs that dont summon? Cant say I recall seeing any, ever. Please expand on that. Lots of newer mob do not auto-summon post 50. I first encountered this in the revamped Chardok. Somethings just dont summon. Very few mobs in Maiden's summon (at least they never have while pulling them). Also, you want to see 51+ that don't summon, go out to Skyfire, quite a few of the named Drakes/Wyverns are 51+ and don't summon. Go to The Grey, there are lvl 55 sun revenants there, they don't summon. There is also a lvl 55 named rock there named Boulder, he doesn't summon either. The only thing in that summons are " a boulderling" and they are around lvl 42-44 or so. I killed a few 2 days ago with my ranger/cleric combo. Kept conning red to my ranger(53 w/epics) and blue to my cleric (59). After the epic slow, it was easy a cinch to take this sucker down. A 54 ranger friend of mine came by later on and I pulled another one. Conned red to me and my 54 friend blue to my cleric, so some are at least 57-58. This guy also drops magi'kot earring 3ac 7int 5 vs cold mage only. I a 56 cleric just conned a hunter that was yellow to me and yellow to a 55 mage so that makes him 57. Max lvl is not 56. Im a 54 monk and the HUNTERS ALWAYS con RED or YELLOW to me. (Even though i rarely see a yellow one). I think you guys maybe getting them mixed up or something... cause these things are never blue or white at 54.
they have a lvl range ok? I was able to mez these guys at 46. I am 54 and one of these was trained to the zone.He conned blue /shrug. Yes, the one we killed last night was indeed 56th. He conned even (white) to me, 56 monk. Was a fun fight for one group, hits hard and fast, and has a fair amount of HPs.